At Pickhurst, children experience the best of everything and create ever-lasting memories. They lose themselves in a wave of caring and informative staff as well as friendly pupils. They benefit from marvellous, state of the art facilities such as spacious, airy classrooms, extensive, leafy grounds, two adventure playgrounds, innovative sporting equipment and the latest information technology (IPads and laptops) to further their education. Pupils take advantage of the fantastic opportunities available to them at Pickhurst such as trips abroad, fun-filled forest school, an array of extra-curricular sporting and academic clubs which offer something for everyone and educational (yet exciting) day trips. They even get the opportunity to play the ukulele! Aspiring actors and singers have the opportunity to shine in various school productions throughout the year performing at well-known venues such as The O², Fairfield Halls, Croydon and The Churchill Theatre, Bromley. The Pickhurst Choir regularly performs at local churches during the festive season, an event which is appreciated by all of the community. Sport plays a large part in Pickhurst life and there are always opportunities to try out for various teams such as football (including girls’ football), netball and hockey. School is, of course, for learning and at Pickhurst you will learn all that you need to know from knowledgeable staff who maximise every child’s potential. Learning environments are well-resourced, keeping children focused and on task. At Pickhurst, no one gets left behind in lessons. After reading all that our amazing Pickhurst has to offer, we feel sure that you will no longer have any lingering doubts. Come and join us today, create your own life-long memories and become part of the Pickhurst Way of Life! 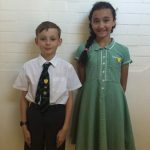 Mr Rampton and Mr Siggs interviewed children who had been recommended to represent the school as Head Boy and Head Girl and their Deputies. Their roles are to promote the Golden Rules, act as good role models and promote good behaviour. Senior Prefects are also chosen to support the Head Boy and Head Girl. Each member of the ‘Pupil Parliament’ will also be appointed as a ‘Minister’ of a subject from the National Curriculum. The Ministers will support the adult Subject Leaders to develop new ideas and initiatives within their subject areas. School council representatives for each class are voted for through a democratic process. They have a say in how the school can be improved and meet regularly with Mr Siggs, Deputy Head Teacher. A school council represents the views of all pupils. It gives children the opportunity to make their voices heard and feel part of the whole school community. A school council helps to make changes and improvements, and tries to make the school a nicer placer for everyone. At Pickhurst, every class chooses two representatives to be members of the school council. Voting for council members takes place at the beginning of the school year. Before they are voted for, nominees have to give a speech to their class explaining why they want to be on the council. What will our school council do? The school council also meet with the school governors to discuss their plans for the year ahead. Treat myself and others with respect. Be responsible with property and belongings. Play friendly and fair games. Walk calmly and quietly around the school. Work hard and always try my best. Dojo points are awarded to children for excellent behaviour and a Dojo time of fun activities is enjoyed at the end of the week. Without fail, Pickhurst is a school with many amazing areas, topics, pupils and staff. Children look forward to an exciting school day full of new surprises. You definitely couldn’t ask for better!